Get relief today for your incontinence issues, common to all ages, with this all-inclusive bedwetting and incontinence solution! The Wet-Detective kit includes everything you need, a complete incontinence solution, to manage or overcome your bedwetting issues. 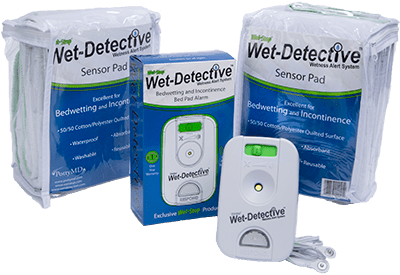 A wetness sensor pad is connected to an alarm that lights up and/or sounds off, speeding your response to wetness incidents – replacing wet bedding and clothes – for better health. 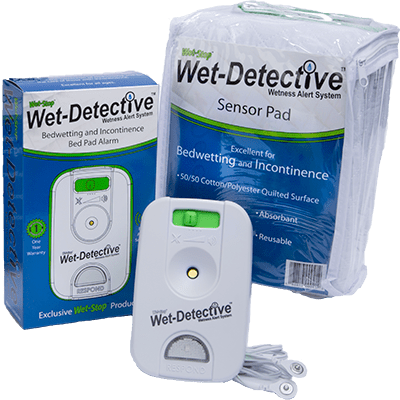 Wet-Detective™ Sensor Pad dimensions are 34″ x 34″ (86.36cm x 86.36cm) and are made with poly/cotton quilted absorbent material with a waterproof backing. Machine washable and waterproof. Special sensing wires within the pad maximize urine detection. The pads are easy to position directly underneath the person and on top of a bed or chair.